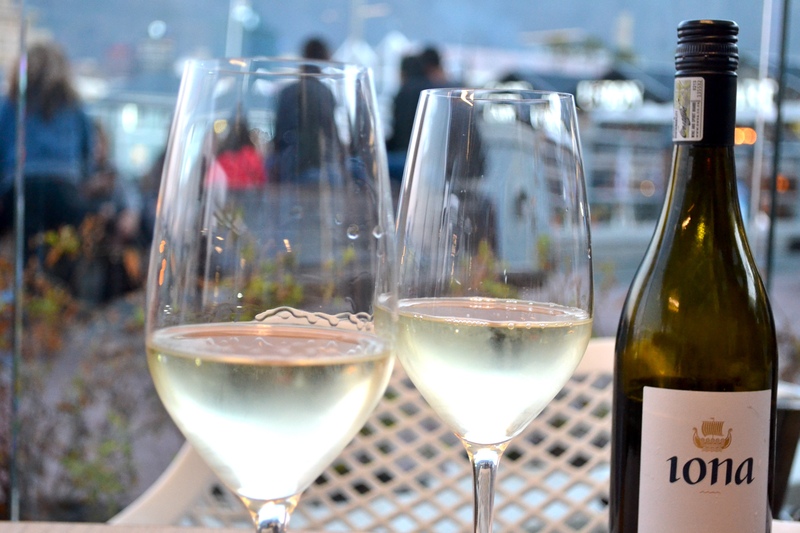 If seafood tickles your pickle, and you love a good selection of wines when you dine, then the new Firefish restaurant is the place to be this summer! Recently launched in the heart of the V&A Waterfront in Cape Town, overlooking the harbour and with a backdrop of the ICONIC Table Mountain, this little gem has the atmosphere of an absolute Summers day bliss! And if dinner is more of a winner, then it is the perfect place to watch the sun go down, sippin’ on speciality cocktails while gazing into a canvas of the lit-up city lights. Think cosmopolitan living! Location, location, location is all I can say! Crisp and fresh, Iona for the girls! Now – let’s get to the good part. THE MENU! Firefish have some sea-riously delicious menu picks. With enough choice, and a bite for everyone to enjoy, you can expect the widest selection, from seafood to land food, and even a special place on the menu for the vegetarians – you don’t see that everyday – yay! Did I mention the overflowing sushi selection, fresh from the ocean? I had the absolute pleasure of tasting a few of the picks on the menu. A friend and I started the night off with a glass of cold and crisp Iona Sav Blanc. Super refreshing and ice cold to the pallet. That’s what Summers about, right? We were then presented with freshly baked bread and butter to nibble on while we decided what to have for dinner. 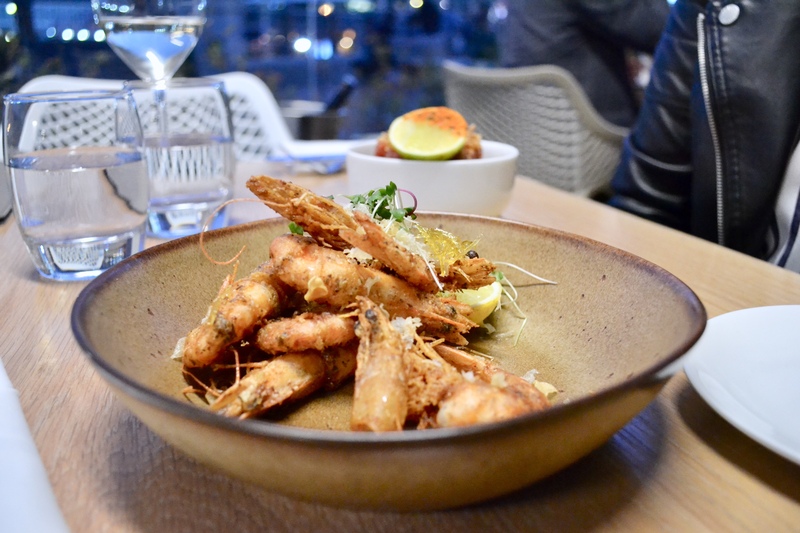 Of course, being a seafood lover, I just HAD to try the first thing that jumped out at me (besides the sushi) – crispy PRAWNS with garlic, lemon and Sichuan! These were delicious, but my absolute favourite of the starters that we ordered was the Tuna Tartar. MY, OH MY! I literally do not have words to describe the absolute beauty of what I tasted. It was like heaven on a fork – seriously! 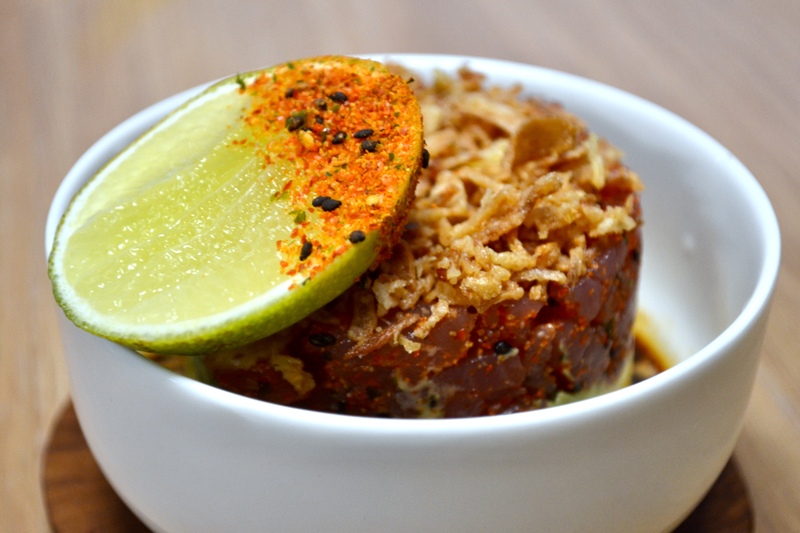 An avocado base with a tower of seared tuna, crispy shallots and the most delectable soy lime dressing. That experience in itself was just utter mouth-watering perfection! 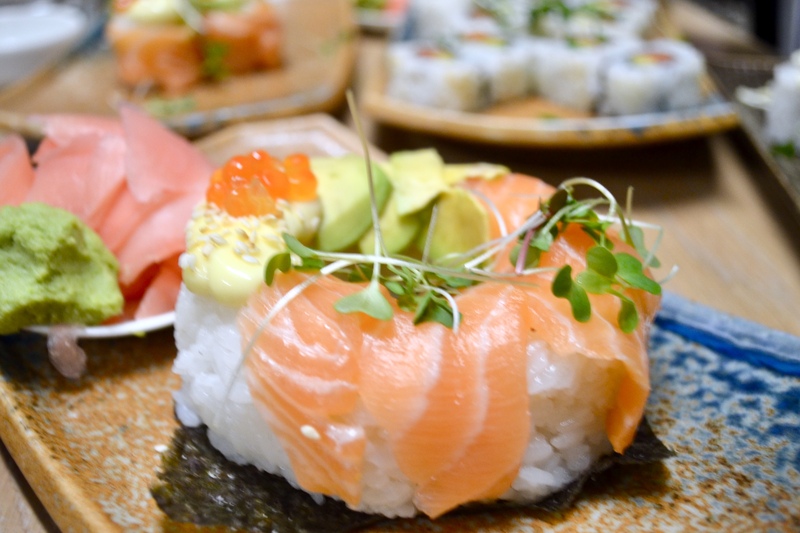 With an intro so delicious, it only made sense to order from the sushi menu – and that we did! We started off with the classics – because HEY, you can never go wrong with those, and boy were we right! The Salmon California Roll and Salmon Roses were up first. They were superb! One thing that really stuck out to me was the generous portion sizes. 8 pieces per order, except for the 3-piece Salmon Roses. One things for sure about those – they had me at Japanese mayo! 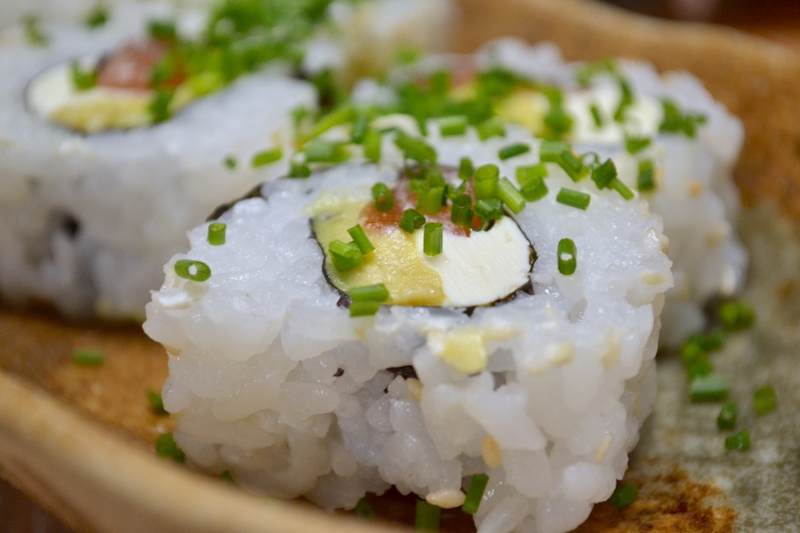 The Signature sushi plates were up next, one of my favourites – The Ultra Phili roll. 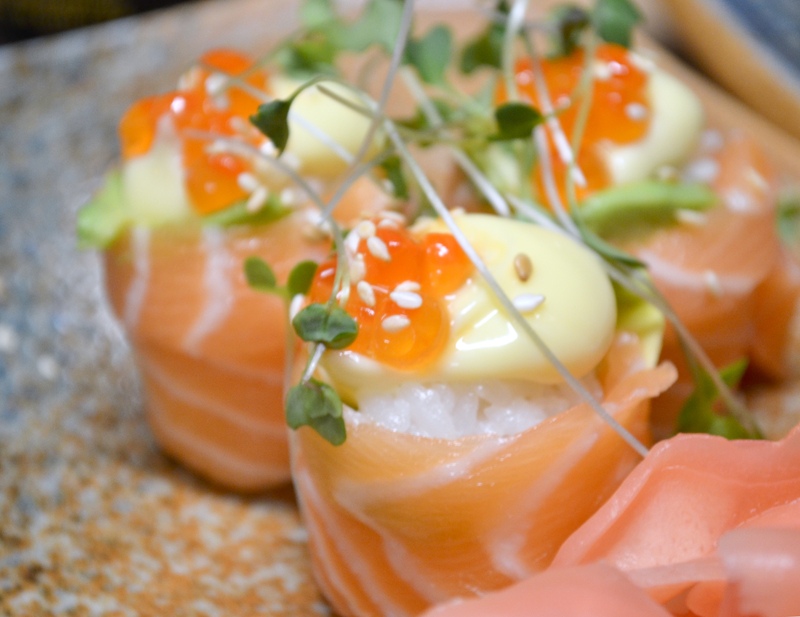 Think salmon, avocado and Philadelphia cream cheese all wrapped into one, and you have a winner! Something different, which I have never had before in the land of sushi is the Sushirito. 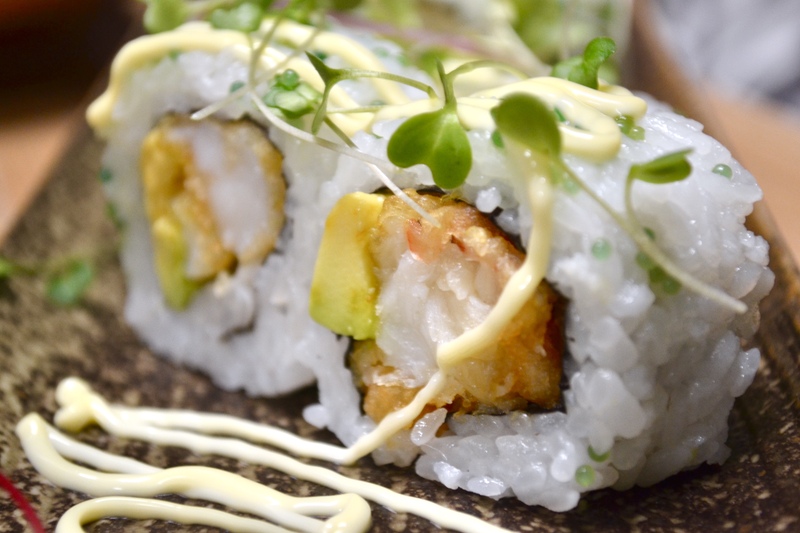 Tempura prawn, avocado, Unagi, drizzled in spicy Japanese Mayo, for a delicate kick. Pair this with some pickled ginger, with a dunk of soya sauce, and you might just find yourself in heaven! With everything being as delectable as it was, one of my favourites, was the much-anticipated sushi DONUT! Yes, you read that correctly. The sushi donut has made its way into town! All the treats, without the sweets. This way, dessert lovers can still get away with not ordering off the sweet list. Shaped like a donut, and draped in salmon and avocado, with a sprinkle of salmon roe and sesame seeds, this was a super delicious way to end the night. Be prepared to eat this one with your hands. This donut has a way of getting down ‘n dirty. Although the “Happy Ending” menu has much to offer, from spiced carrot cake, cotton cheesecake to chocolate macaroon pie, we couldn’t possibly indulge in anymore deliciousness for one night. Don’t worry though, I have promised myself to pop down for coffee and a dessert of sorts to make up for it. I cannot tell you how excited I am to go back and enjoy this! All in all, Firefish is an absolutely cracking restaurant! This is the perfect place to be this summer. 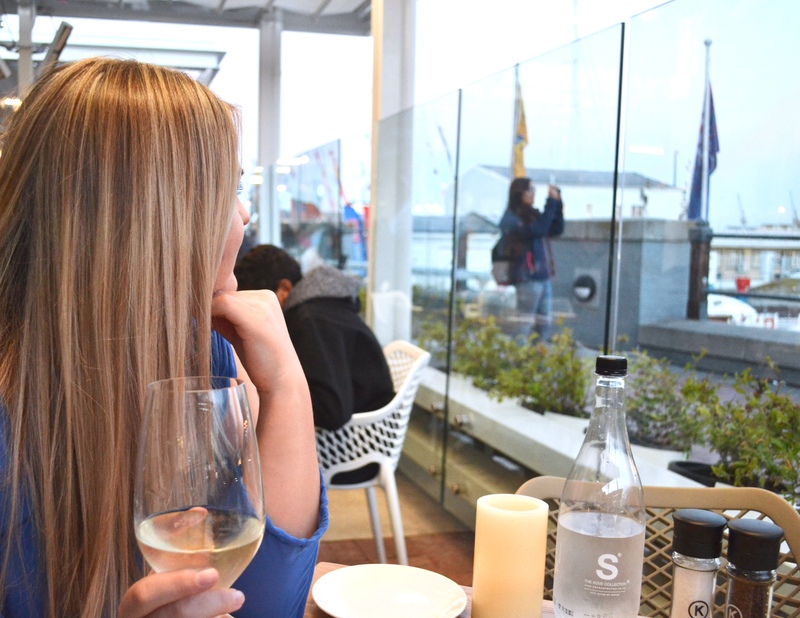 A delectable menu, nested amongst the bustle of the Waterfront, with excellent friendly service and some sea-reously fresh food. It’s the PERFECT way to get the Summer time feels going! And yes, their fish is on fire!